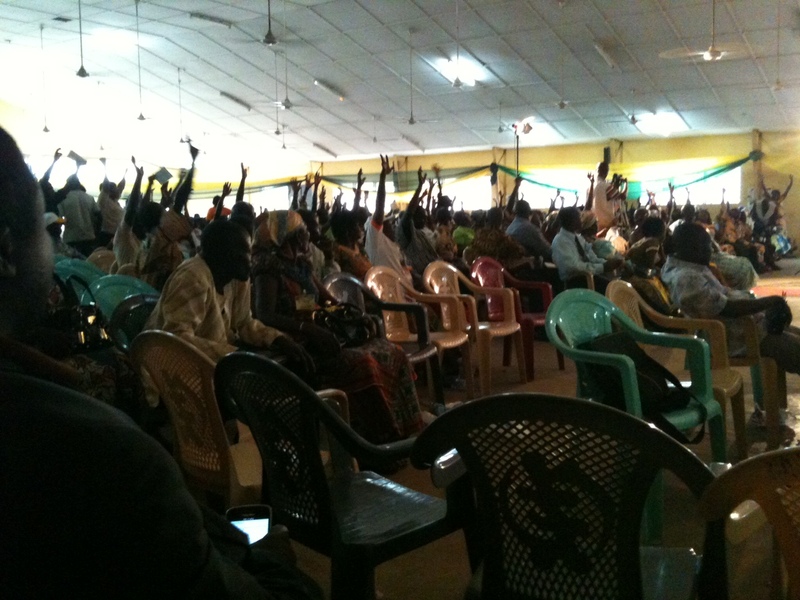 It’s AGM time again at Kuapa Kokoo – when the 45000 farmer members get together to hear how the organisation and business is doing, celebrate achievements, and debate future issues. Their chocolate company, Divine, is invited to report on its progress to its farmer owners. Kuapa Kokoo organised its Annual General Meeting a bit differently this year. 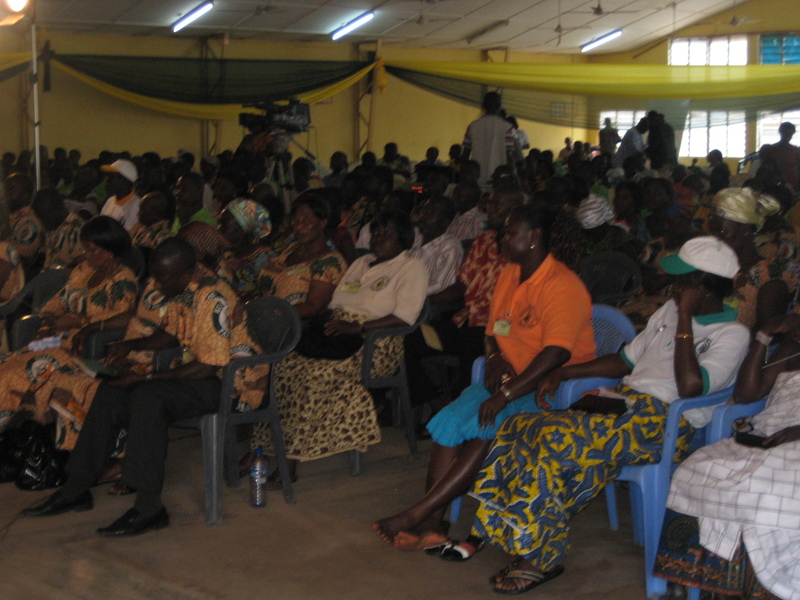 Instead of one enormous event with representitives from all 1400 villages, now members from each of the 54 districts attend their own AGMs, and then send representatives to the final AGM in Kumasi. This way, in smaller forums, more people can really take part. 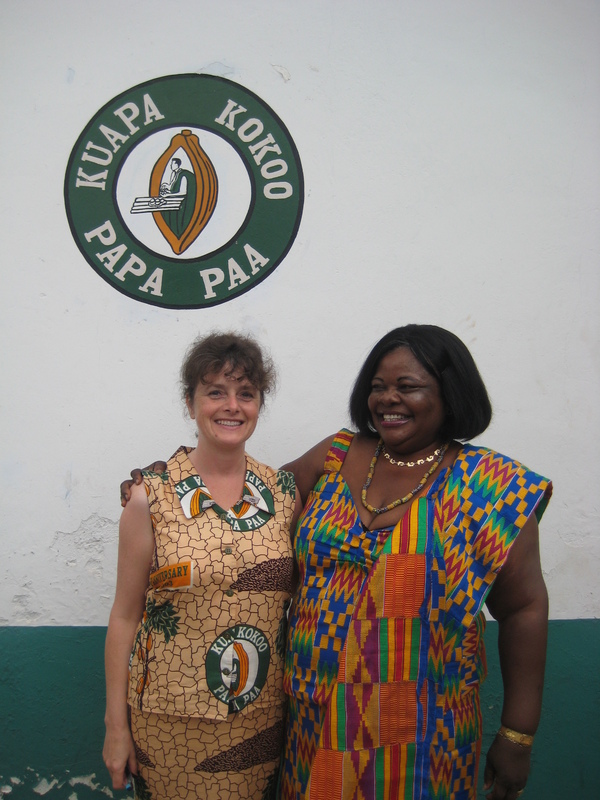 Sophi and I flew to Ghana to attend the final AGM and a week of meetings. I hadn’t been to Ghana for 18 months – so I was very happy to see everyone again, and particularly to meet up with the farmers who have visited UK over the years. 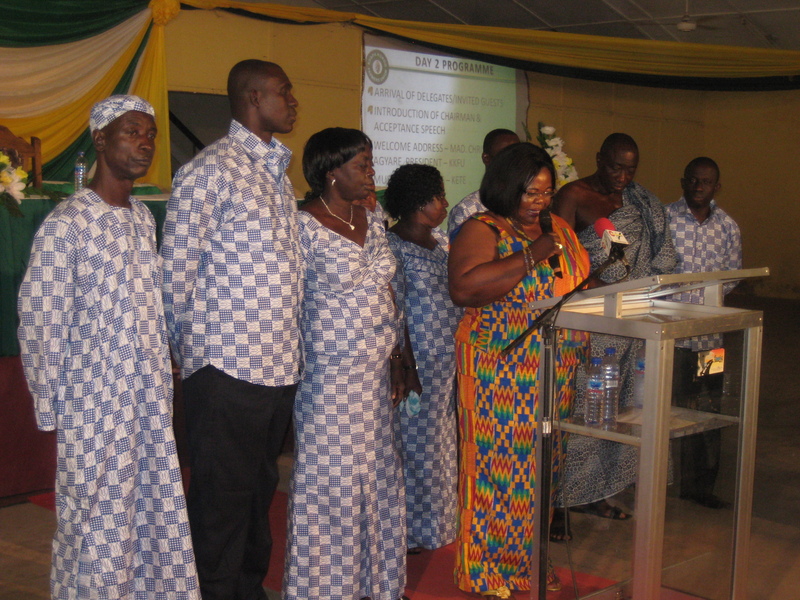 Many of them, like Anna Awere and Kojo Aduhene Tano, are now on the National Executive Committee. The AGM ran over two days at Kwame Nkrumah University of Science and Technology – a great university campus with space for all the farmers to gather. Members are bussed into town, all looking fantastic in best Kuapa outfits, and come with a lot of energy and enthusiasm to participate and celebrate together. Lots of impressive dignitaries also arrive – and Sophi and I are flanked by very stately men in full costume. There is a full programme – including a comprehensive report on all the different parts of Kuapa Kokoo Farmers Union, presentations on issues important to farmers, and a series of break out workshops, where specific issues are debated. Farmers are not backward at coming forward in these workshops and making their ideas and concerns known. Views are then fed back in a plenary session. Drummers and dancers entertain us during the breaks – and, slightly bizarrely, ‘The Kings Speech’ was showing as everyone arrived! And of course everyone gets to enjoy some Divine chocolate. The AGM ends with votes and Sophi and I were invited by the NEC to a great dinner dance complete with Hi-Life band. Sophi was voted best dancer. 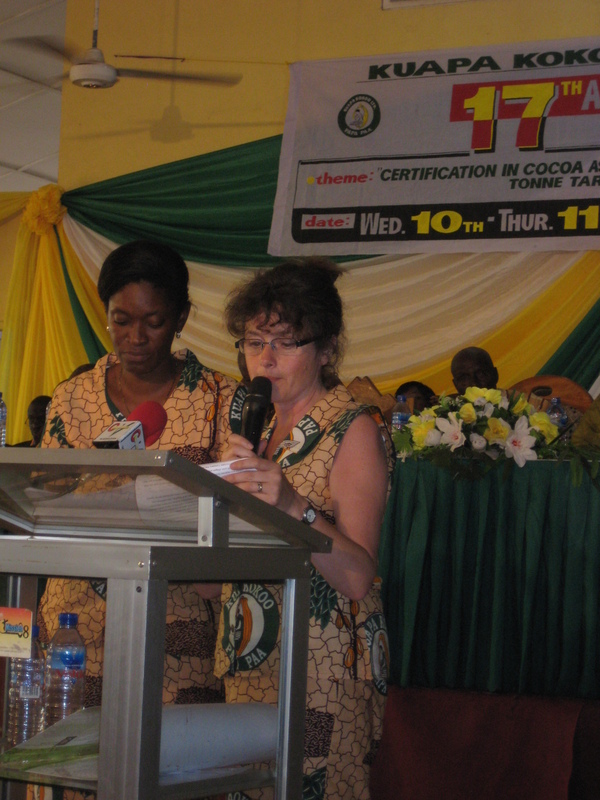 This entry was posted on Thursday, September 15th, 2011 at 10:38 and is filed under cocoa farmers, cooperatives, Ghana, Kuapa Kokoo, Women empowered. You can follow any responses to this entry through the RSS 2.0 feed. You can leave a response, or trackback from your own site.